Music therapy is VITAL in dementia care! As dementia takes it’s increasing toll on a person’s mind, music often remains as something that can be recognized and engaged in. Why is this? Music is processed globally in the brain. There is no “center for music” in the brain, rather, the many different elements in music are processed in many different locations. This makes music an ideal tool when working with those who have brain damage, including dementia patients. These folks may not be able to process all of the aspects of music, but wherever the brain is left untouched by the damage, music is still being processed, and people are still able to participate in music. Each of us spend a lifetime creating emotional connections to music. These responses to music remain accessible throughout most of the dementia progression. Why? Research indicates that the medial prefrontal cortex may serve as a hub where music, memory and emotions meet. It is also one of the last brain regions to atrophy in Alzheimer’s patients. This means that we can access a person’s emotional connection to music, and use that access to help bring about positive emotional change in our patients. Loss of memory is the hallmark of dementia. Why is it, then, that a patient with advanced dementia can remember the lyrics to a song, even when they cannot remember the people they love? Again, it all hinges upon the fact that there are parts of the brain that are still in working order. Those lyrics are stored in a place that remains accessible far into the dementia process. Most dementia patients seem to delight in the shared experience of singing. It is as if they are thinking “Finally! I know what this person is talking about! I can join with them in the conversation!” There are many smiles of recognition, reminiscence and relief. When we find ourselves responding to an external rhythmic stimulus, (ie, tapping our toe to a song on the radio), we call this “rhythmic entrainment”. 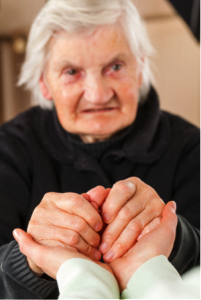 This instinctive response often remains active through the very end stages of dementia. We can use this response to our advantage. For example, as a music therapist holds the hands of a dementia patient, bouncing them to the beat of a song being sung, more often than not the patient will soon take over the making of that movement. This is a wonderful thing, realizing that many of these folks appear to be totally disconnected from the outside world. Suddenly they are participating with another human being, and engaging with an outside stimulus, through the medium of rhythm. We often think of a social experience as a verbal experience. The beauty of music is its ability to create a social experience that is non-verbal. Conversation inevitably becomes increasingly difficult, as those with dementia can’t remember their loved ones or care-givers or what they did earlier in the day. Eventually, the very ability to speak coherently fades. However, people can still interact with each other through the making of music. It’s one of the few ways dementia patients have left to interact, to be successful, to reminisce and to create with other people. Multiple studies show that music can decrease disruptive behaviors. Listening to a patient’s preferred music during mealtime or bath time has shown a decrease in disruptive or aggressive behaviors. Additionally, participation in music therapy sessions decrease agitation not only during the session, but immediately afterwards as well. Click here to see current research on music therapy in dementia care.